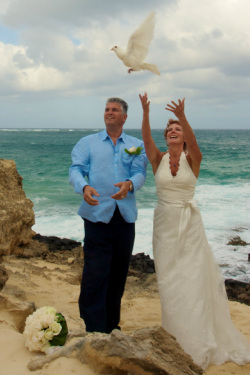 The bride and groom each hold a dove. After being released the two doves circle around together and then fly home - a gorgeous symbol of a couple's new life together. Doves mate for life and to show a willingness to work hard together. Both doves work together to build a nest. Next, when the mother lays the eggs, both the father and mother keep them warm. When the young chicks are born, both doves actively care for and tend to the new family members. Over the years, the dove has become a common theme in just about every culture's wedding traditions. The two doves together, preparing to bond for life and raise a family, is a symbol that all people can understand and appreciate. Groom’s_______ & Brides name_______: This is a special day as you have chosen this beautiful corner of paradise that we call the Garden Isle of Kauai as the place you will declare your abiding love for each other. Here in the Hawaiian Islands when one leaves or arrives, people say “aloha”. For the Hawaiian people the word “aloha” has three meanings. I believe that each of these meanings has significance for y our marriage today. The first meaning of “aloha” is “hello”. This signifies that you are beginning a new life together; a life of love and deep commitment. The second meaning of “aloha” is “good bye”. This signifies that you are leaving the past behind as just fond memories and greeting the future with excitement and anticipation.. The third meaning of “aloha” is probably the most important. And that meaning is “love”. As you have been growing in your knowledge of each other, you have discovered together how special love is when it is shared. At this time will you turn to each other and express from your heart “ALOHA”… (by exchanging leis. Exchanging leis is optional). Let me read from I Corinthians 13:4-7 on love that you need to always model in your relationship. you will be loyal to them no matter what the cost. and always stand your ground in defending them." (Couples face each other with their hand joined and repeat after me). I_____, take you,(wife, husband)to be my wife, my partner in life and my one true love. I will cherish our friendship and love you today, tomorrow, and forever. I will trust you and honor you. I will laugh with you and cry with you. I will love faithfully through the best and the worst, through the difficult and the easy. What may come I will always be there. As I have given you my hand to hold so I give you my life to keep, as God is my witness. cheap nor common; indeed, love may cost us dearly. an end; we must keep it continuous. As you wear these rings, whether together or part for a moment, may they be constant reminders of these glad promises you are making today. ­­­­­______ (Groom) I give you this ring as a sign of my love and faithfulness. ______ (Bride) I give you this ring as a sign of my love and faithfulness. May these beautiful rings be a sign to each of you of the continuing love you pledge to each other today. Let me share four things that I believe are imperative for a growing and exciting marriage. You may imprint them on your mind by remembering that when you put the first letter of each word together it spells BEST. Bless - Speak well of each other often. Express and share appreciation for the small things as well as the big things they do for you. Edify - Cheer each other on in every area of life. This will encourage, strengthen and bring harmony and peace. Never criticize or tear each other down. Share - Share your hearts and feelings everyday with each other. Another word for sharing is communication. Take time each day to focus attention on each other. Learn to listen to what each other means as well as what they say. Touch - Marriage is a hands on relationship. Let there be plenty of caressing, hugging, touching and kissing. Remember! You both chose THE BEST! Take care of each other the way you want to be cared for. With this union of hearts and hands, and by the authority vested in me as a minister and by the laws of the State of Hawaii, I pronounce you husband and wife. At this time you may kiss the bride.